A simple flame can do wonders for warming the body and the soul. A point of light gives hope in darkness and the heat of a flame brings comfort in the cold. The heat of a candle can be captured to create a comforting personal heat system. 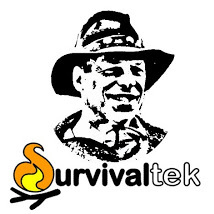 This is particularly effective when your circumstances are sedentary in nature such as when sitting in a hunting blind, guard shack, disabled vehicle, or even in your home or workshop. It goes without saying that you should always be careful around an open flame, observing precautions to keep flammable objects at a safe distance and the flame source in a stable position. In tight quarters be sure to have adequate ventilation. The following is a set-up that I have used successfully that you may find helpful. The objects needed are a metal coffee can, a tea-candle, matches or a lighter, and a blanket, sheet, poncho or other body cover. In a sitting position I place a coffee can on the floor between the heels of my feet with the open end up. Then I place a tea-candle inside the can along the bottom edge. This position allows room for my hand to reach in with a match or lighter to light the candle. 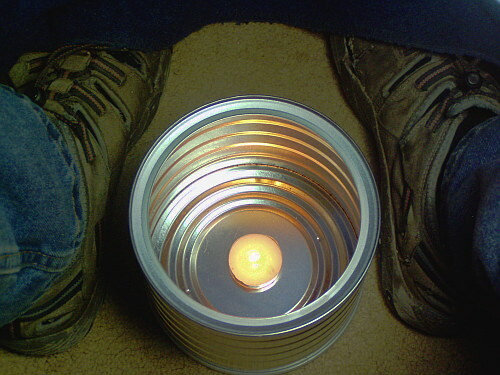 Once lit, I reposition the candle to the center of the can to provide even heat and a safety zone. Next, I place the blanket around my shoulders and over my lap which forms a tent-like covering. This captures the heat that rises from the candle and holds it around my body. The can enclosure shields both the flame from the wind, and adjacent clothing from the flame. This heating set-up would be good to store in your vehicle on the occasion that you might get stranded during a Winter storm. This entry was tagged Blanket, Can, Candle, Emergency, Flame, Heat, Heater, Kit, Safety, Winter. Bookmark the permalink. I have those items in a 2 gallon bucket IN MY VEHICLE(with alcohol soaked cotton balls, firestarter cut in squares, waterproof matches,etc)..after watching a documentary of a couple that lost their toes to frostbite in a snowstorm after leaving their car. This is a good idea for emergencies, or even if you just want to create a mood. It’s a physical & psychological comfort. I started making what my Mom calls ‘car candles’ about 2 decades ago, but with 1/2″ holes spaced around the top, about 1/2″ down from the lip. These holes allow you to put a small, lightweight pot on top, with water for coffee or tea or soup. All of these little instant packs can be stored in watertight bags, in a box in the trunk of your car, along with blankets and other emergency supplies. I reuse candle wax in these cans. In a pinch, cotton shoe laces, or cotton twine, make perfect wicks. I thought abt using this for ice fishing except I would sit on a folding stool with the can and candle positioned under the stool. I’d don a poncho, which will drape around the stool to the ground.